The folks behind Moaning Cavern Adventure Park weren’t lightly tossing out the word “adventure” when creating the park’s title. This park truly offers some unique activities for all levels of the self-proclaimed adventurous. First, let’s talk a bit about the Moaning Cavern itself. The main chamber is so massive, it could actually enclose the Statue of Liberty entirely. In fact, it is actually the largest chamber available to experience in a public cavern in California. Impressive. There are three ways to experience the cavern, and the first is a 45-minute guided walk-tour. Visitors descend 165 feet into the caverns as guides explain the history and geology of the cavern, and discuss the explorations that have traced the cavern to its current depth of 410 feet. A fascinating end to the tour is the site at which excavators discovered the bones of prehistoric humans who stumbled into the mouth of the cavern, falling to their death centuries ago. While the walking tour is an exciting yet calmly paced adventure, the park also offers a rappelling experience for those seeking something with a bit more punch, allowing thrill-seekers to descend 165 feet into the cavern on a 45-minute excursion. All the high-quality equipment — including hard-hats, ropes and gloves — are provided. 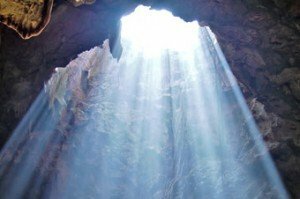 As if that wasn’t enough, they also offer a three-hour spelunking tour with the option of beginning the tour with the rappelling adventure. Most areas of the cavern are undeveloped (meaning no lights, stairs, or walkways), so visitors are offered an exhilarating opportunity to explore by climbing and belly crawling with lighted helmets to show the way. This trip is conducted by experienced, highly trained guides, so no experience is necessary. Not all the excitement happens hundreds of feet below the foothills, however. Above ground, Moaning Cavern Adventure Park also offers a brand new 32-foot custom designed climbing tower, offering routes for beginners and experts. The tower comes equipped with a belay system, allowing visitors to be harnessed and clipped to the route of their choice. When finished with the route, climbers simply jump back for a smooth, automatic descent. The last attraction, but certainly not the least adventurous by any stretch, is the zip lining. Moaning Cavern now offers three above ground, no experience necessary zip lining adventures. The Regular Zip sends adventurers zooming over the gorgeous grounds at speeds exceeding 40 miles an hour, while the Tandem Zip allows the experience to be shared by two. For those who’ve secretly longed to fly like Superman (or Supergirl, for that matter), the Super Style Zip has a harness which offers visitors the chance to experience the zip line in true superhero fashion, soaring like a bird over the park. You’ll need to provide your own cape, however. Moaning Cavern Adventure Park is truly a park for those with the desire to experience something a bit different. With so many options at your fingertips, you could easily bring the family or a group of friends and know that there will be something for everyone. AND it’s just a ten-minute drive from Murphys.